Sidney Slon/Staff Photographer Freshman guard Sam Sessoms garnered 19 points on 8-for-15 shooting in a road loss to the Army Black Knights. 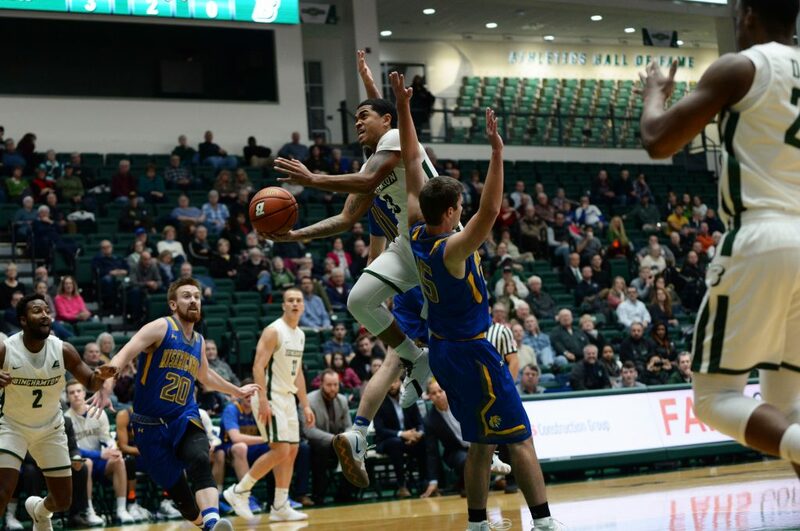 Coming off its second win of the season on Saturday, the Binghamton men’s basketball team fell to Army Wednesday night on the road, 67-56. The Black Knights (3-5) took advantage of a 15-3 stretch in the second half to keep the Bearcats (2-5) from earning their first victory away from home. Despite the eventual defeat, BU remained in the game for at least the first 20 minutes of the contest. In front of 500 fans, the Bearcats and Black Knights battled primarily on the defensive end with both teams struggling offensively. Both teams cashed in on just 20 percent of their triples, converted only one free throw each (six combined attempts) and failed to eclipse 40 percent from the field. Even with the shortage of offense, freshman guard Sam Sessoms paced the Bearcats by accounting for seven of their 24 first-period points. While it appeared to be a game characterized by defense early on, Army quickly turned the tide in the second half. With the game locked at 29, Black Knights junior guard Tommy Funk helped build a 12-point lead off a long ball and a layup. Undeterred by the lead, graduate student guard J.C. Show went on to knock in two 3-pointers while senior forward Caleb Stewart recorded a layup to trim the deficit to five with seven minutes remaining. Even though the Bearcats managed to counter, their luck was short-lived as an Army trio of junior forward Matt Wilson, sophomore guard Tucker Blackwell and freshman guard Josh Caldwell poured in treys, free throws and jumpers to ice the game. Wilson finished the game with 16 points and 11 rebounds, while Funk flirted with a triple-double by posting 13 points, eight dimes and six boards in 39 minutes of action. While Sessoms’ game-high performance of 19 points, along with Show’s 13 points, highlighted solid individual performances for the Bearcats, the team collectively did not have its best showing when compared to Army. The Black Knights registered 16 points off of 10 Binghamton turnovers, outscored BU’s bench by 10 points in the second period and logged 10 more second-chance points in the second half. Additionally, Binghamton’s inability to get to the charity stripe and its inefficiency in making free throws (1-6) denotes a desperate need for improvement. The Bearcats will look to get back on track with another matchup with a Division III school on Saturday. Tipoff against Hartwick College is scheduled for 2 p.m. from the Events Center in Vestal, New York.